Using just a simple inexpensive micro-thin glass surgical needle and laser light, University of Utah engineers have developed an inexpensive way to take high-resolution pictures of a mouse brain, minimizing tissue damage — a process they believe could lead to a much less invasive method for humans. Typically, researchers must either surgically take a sample of the animal’s brain to examine the cells under a microscope or use an endoscope, which can be 10 to 100 times thicker than a needle. With the new “computational-cannula microscopy” process, the small (220 micrometers) width of the cannula allows for minimally invasive imaging, while the long length (>2 mm*) allows for deep-brain imaging of features of about 3.5 micrometers in size. Since no (slow) scanning is involved, video at the native frame rate of the camera can be achieved, allowing for capturing near-real-time live videos (currently, it takes less than one fifth of a second to compute each frame on a desktop computer). In the case of mice, researchers use optogenetics (genetically modify the animals so that only the cells they want to see glow under this laser light), but Utah electrical and computer engineering associate professor Rajesh Menon, who led the research, believes the new process can potentially be developed for human patients. That would create a simpler, less invasive, and less expensive method than endoscopes, and it could be used for other organs. Menon and his team have been working with the U. of U.’s renowned Nobel-winning researcher, Distinguished Professor of Biology and Human Genetics Mario Capecchi, and Jason Shepherd, assistant professor of neurobiology and anatomy. The research is documented in the latest issue of open-access Scientific Reports. 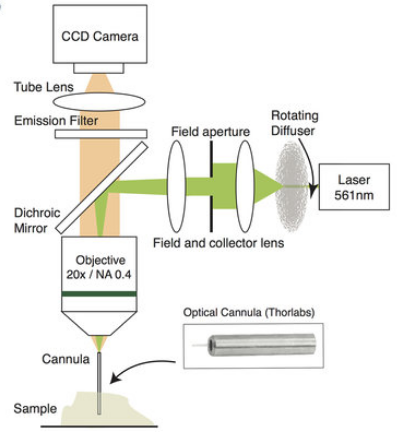 Here we demonstrate widefield (field diameter = 200 μm) fluorescence microscopy and video imaging inside the rodent brain at a depth of 2 mm using a simple surgical glass needle (cannula) of diameter 0.22 mm as the primary optical element. The cannula guides excitation light into the brain and the fluorescence signal out of the brain. Concomitant image-processing algorithms are utilized to convert the spatially scrambled images into fluorescent images and video. The small size of the cannula enables minimally invasive imaging, while the long length (>2 mm) allow for deep-brain imaging with no additional complexity in the optical system. Since no scanning is involved, widefield fluorescence video at the native frame rate of the camera can be achieved.